Having used our multi-posting tool to post out your adverts, all of your applications will be directed straight into idibu. Depending on your account set up, these applicants will either be processed directly into your CRM as candidates, or will remain in idibu for you to review and action. The latter approach may be preferred if you want to use idibu auto-responders to automate your applicant engagement, or manage the quality of candidate data within your CRM. It's completely optional as to which of these works best for your business. If you are unsure what process is set up on your account, then speak to your account administrator. Want to know more about these options? If the candidates are handed immediately to your CRM, then you can start working with them from the vacancy or candidates area of your CRM. In this article, we're going to look at how you can review your applications, and the different ways you can process your applicants inside idibu before forwarding them to your CRM. How do I know I have new applicants? You have an alert set up by default on your idibu account that will email you when you have a new applicant. If you wish to remove this alert at any time, you can easily do so. Whenever you access the idibu area of your vacancy, you will be able to check for new applicants by looking at either the ATS widget, or by entering the idibu candidates page. 1. You can access and review your applicants at any time by accessing the Candidates tab inside idibu. ...or when you hover with your mouse over the candidate, the option to click 'CV' appears under their name. 3. 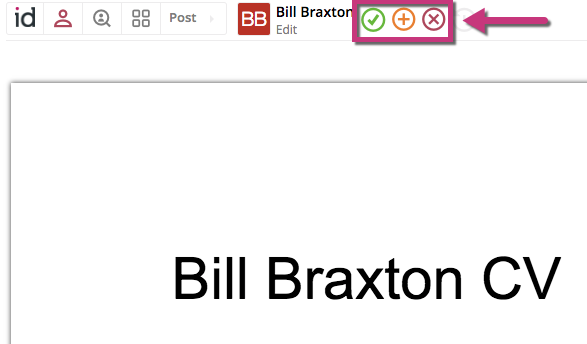 Clicking this will take you directly to the candidate's CV preview tab which will display the candidate's original CV. Want to know more about reviewing CVs? ...or from the applicant list in the ATS. If you wish to progress their application, click the Green Traffic Light button. What happens next will depend on how your CRM Handoff tool is configured. Either a single click will forward the candidate to your CRM, or a drop down list will appear prompting you to select the ATS status you wish to allocate to the candidate. It depends on how your CRM handoff has been set up. Take a look at this article for more information about how these applicant forwarding options work. The Amber traffic light button is for when the candidate is not suitable for the role but you wish to retain their details in your idibu talent bank. They will be moved to 'Keep on file' in the ATS. If you are using our local search tools they will then be searchable inside idibu for both you and all your colleagues. You can now select an option in the CRM handoff that will allow you to forward your keep on file candidates into your CRM, but NOT against the corresponding vacancy. Take a look at last section in this article to learn more about how we forward these candidates to your CRM. RED - Rejecting and deleting the candidate completely from idibu. If you have assessed that the candidate is not suitable for your role, and not someone you want to retain in your idibu candidate pool, click the red 'x' icon. This will remove them from both the ATS workstream and your idibu account. TIP: Some clients prefer to remove this option. You account administrator can do this in the account settings area. If you don't see this as an available option, then it has been removed from your account. Depending on your account package, you can also use Autoresponder messages. These will be sent to the candidates automatically when you conduct one of the three actions above, and the message is tailored accordingly.